Tight Fit at WTM 2015. It was basically a bunch of huge tires with a cargo net draped over it. It caught everything, and your head fit through the holes and “clothes lined” you multiple times. I've been a pilot since 1996 and married since 1999. I have four boys, ages 9, 8, 6, and 3. My wife works part-time as an attorney, so I am a full-time dad on my off days. I never really competed in anything until my wife signed me up for a half-marathon in 2011 to benefit adoption. My friend, Yancy Culp, helped me train to meet my goal of running it in under two hours. 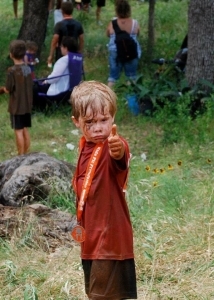 After that, he recommended that I try OCR. I ran my first Tough Mudder with some friends in 2012 and have been running 5-6 OCR races each year since then. I like the full-body workout that it requires. I like that it is something I can semi-regularly compete in and in which I can continue to see improvement. 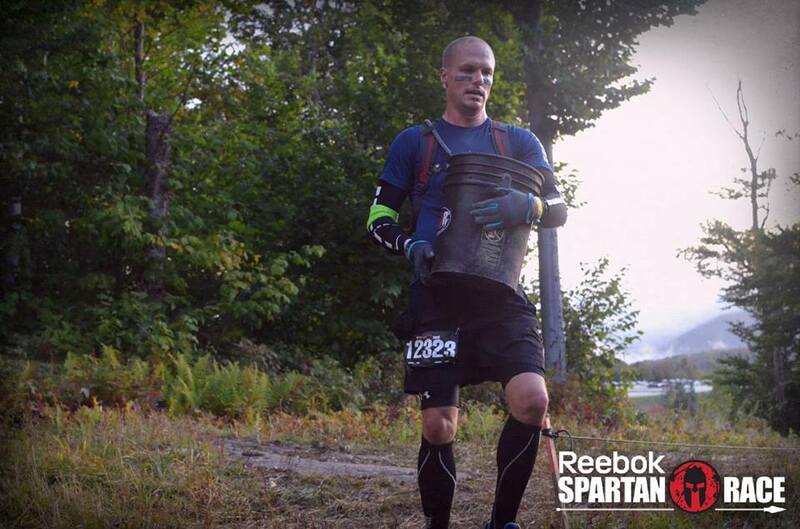 Competing keeps me motivated in my training and makes it more of a lifestyle choice rather than a one-time event. Also, it is something my kids can be involved in. I don't have a gym membership. Everything I use is set up at my house where my kids can participate. I try to keep it simple (I.e., my pull-up bar is a 2×4 tied to a garden hose and looped over a tree). I've also enjoyed the people I have met in OCR. What is the coolest part about being a corporate pilot? Have you flown any notable clients or had any memorable experiences? The coolest part is traveling to great destinations. I've flown a lot of politicians, a few professional athletes, and a movie star. Most of my passengers are business owners. Have you ever flown yourself to a race? No, but sometimes I take advantage of a trip and look for a local race to run while I am there. How did you get into OCR in the first place? Did you ever have a “That’s it, I need to change” moment regarding your fitness? I was nearing 40 and losing my hair. I decided to shave my head and didn't want it to look like a bowling ball. 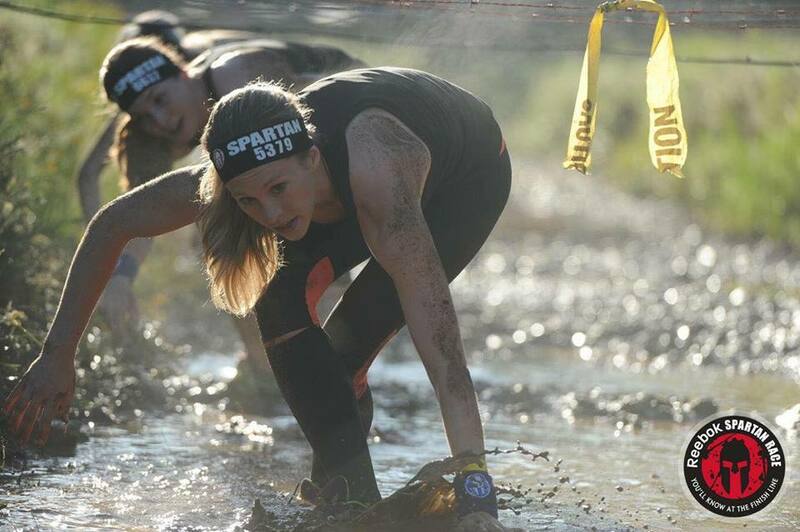 Why did you gravitate towards the longer events, like World’s Toughest Mudder Spartan Ultra Beasts, and BattleFrog BFX? I can grind it out. It seems to be what I am better at. I don't like sprints and wish I was faster, but they are just not my strength. 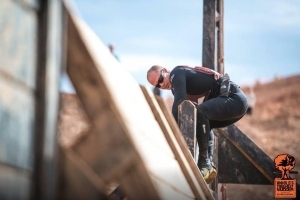 As a father and husband, what advice would you give to racers who want to do World’s Toughest Mudder but can’t train for several hours due to other commitments? My first advice would be to find a way to include your kids as much as possible. Be comfortable when those workouts don't go as planned. Be willing to let your kid ride their bike while you run alongside them. Mine often turned into me pushing them up hills. I try to focus on what I can do rather than what I want to do and can't do, whether it be from injury or being busy. I try to make the most of my time by working out at home and not going to a gym. Look for opportunities to fit in your long workouts and do what you can on the other days, but DO SOMETHING. Describe your emotions at the 30-mile marker at World’s Toughest Mudder when your son motivated you right as you were slowing down. I had just started my sixth lap and was gearing up for a long night. The grind was definitely starting and I was beginning to feel my feet. My wife was running with me on the other side of the rope on the spectator trail and was reading messages to me from friends and family. My mom, who was watching our kids, showed the kids a video of me doing an obstacle. She commented to them that it looked like I was getting tired. My oldest son (Owen) responded, “I know my Dad. He never quits at anything.” Needless to say, I was motivated to keep going and live up to his expectations. It definitely gave me a boost when I was tired. It also inspired me to set that example of determination for them to follow. 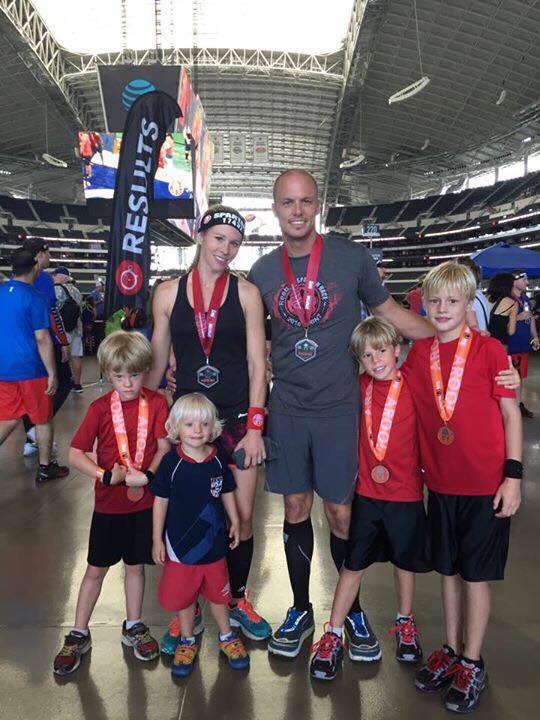 How have you and your wife been able to successfully instill an active lifestyle for your kids? We try to involve them in our training and sign them up for races. They love to compete and I built an obstacle course for them in our backyard! We encourage them to play outside and limit TV and video games. Speaking about maintaining an active lifestyle, how did you lose 35 lbs? I do hard workouts and that helps. I have become a lot better informed about healthy foods and learned to prepare them in ways we enjoy. I don't really exclude foods. My approach is moderation. Describe the running club that you and your wife, Susan, organize at your kids’ school. Your wife is quite the accomplished athlete and working professional, as well. 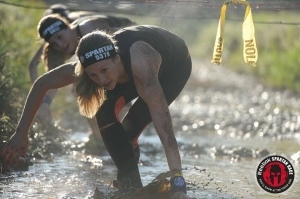 What’s her background and how did you convince her to finally compete in OCR? She ran track through high school, running mostly in the relays. The 400m was her best race. She likes competing and this gives her an outlet for that. After having our last child, she started training more. She entered her first race in 2014 and has been running 4-5 races per year since then. Dirt poor with two boys in college, but hopefully I’ll be running races with my boys and tearing it up in the Master’s Division. Twenty-one. I write on them and hang them on my tie rack in my closet. I did get to design a kids obstacle course for my kids school fundraiser. 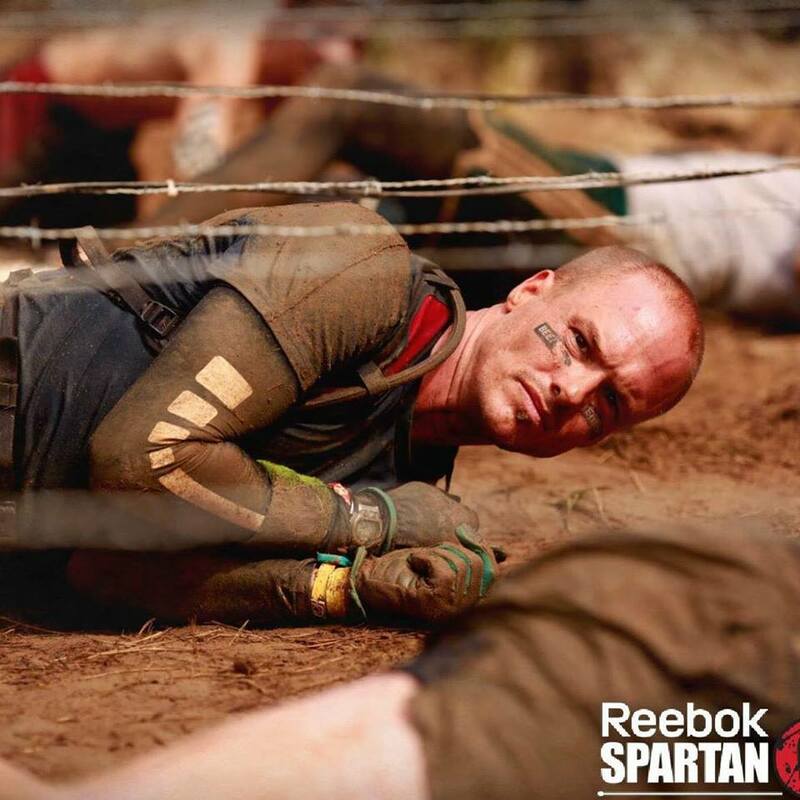 For that one I incorporated a bit of American Ninja Warrior meets Spartan. It was a hit and I got to take it all home!